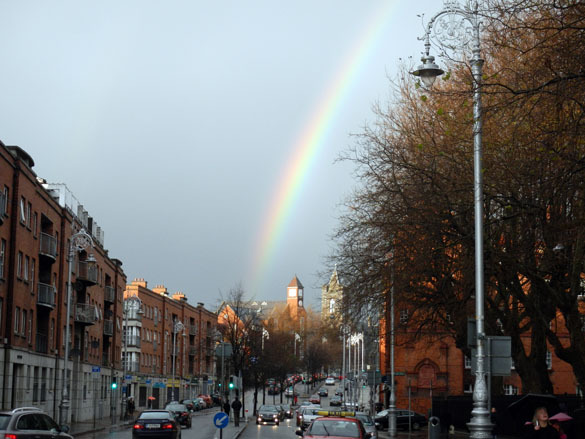 DUBLIN, IRELAND — What could be more Irish than a rainbow over Dublin? (I know better than to write of leprechauns and pots of gold.) It certainly crowned the end of a delightful afternoon spent with my friend Tim Palmer looking at building stones. I am in Dublin attending the annual meeting of the Palaeontological Association. After a long editorial meeting, Tim and I went to the center of the city to look for a particular kind of stone that may have been used in the Medieval portions of the two Dublin cathedrals: St. Patrick’s (National Cathedral of the Church of Ireland) and Christ Church (also for the Church of Ireland but claimed by Roman Catholics — it’s confusing, especially since they are only a short walk from each other). Tim was looking for a limestone called Dundry Stone, part of the Inferior Oolite (Middle Jurassic) in Great Britain. It is notable as a non-oolitic part of the Inferior Oolite, made mostly of tiny fragments of crinoids and calcite cement. Tim quickly found the stone in both cathedrals. This is St. Patrick’s Cathedral. Its exterior is mostly restored, but the interior still retains part of its Medieval core. It dates back to 1191. We asked at the door to see the oldest part of St. Patrick’s, and were immediately directed to this small chapel. At the time the cathedral was filling with people for a choir concert, so we were surrounded with the sounds of bells and children practicing their pieces. This chapel was used as a storeroom as well as a tourist site, so there are some incongruities (such as the folding chairs!). 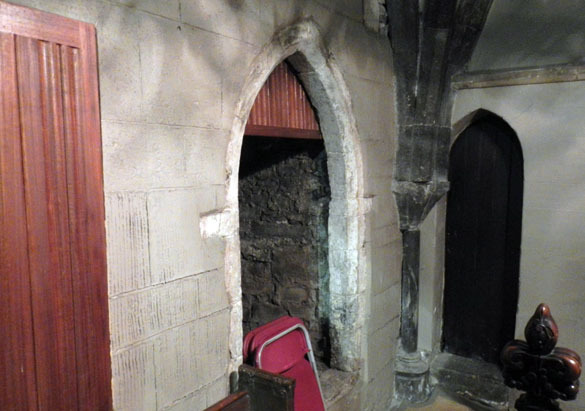 Almost all the stone is either covered with cement or replacements except in a few places, like the frame of this small doorway. That white rock is Dundry stone. 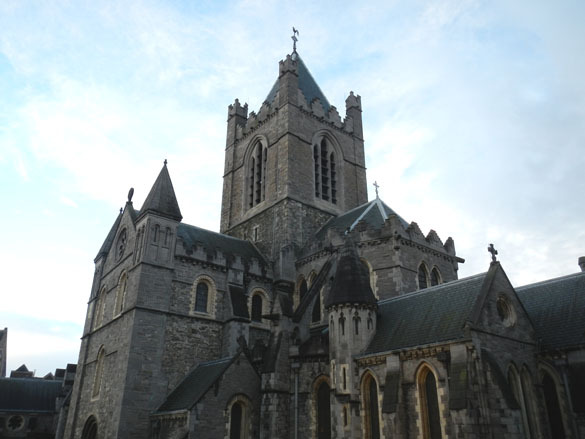 This is Christ Church Cathedral, just down the road from St. Patrick’s. (A rivalry between the two dates back to the 12th Century. Two cathedrals in one city is very rare, apparently.) 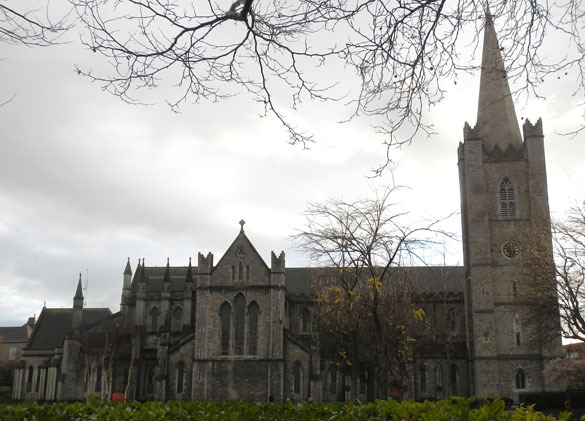 Christ Church is the older of the two cathedrals, dating back to about 1040 when a Viking king of Dublin started construction. It also has a mostly restored exterior, and it too has Dundry stone making up surviving doorways and lintels. This is an excavated “Chapter House” just outside Christ Cathedral on the grounds. Tim Palmer can be seen in the corner making notes. 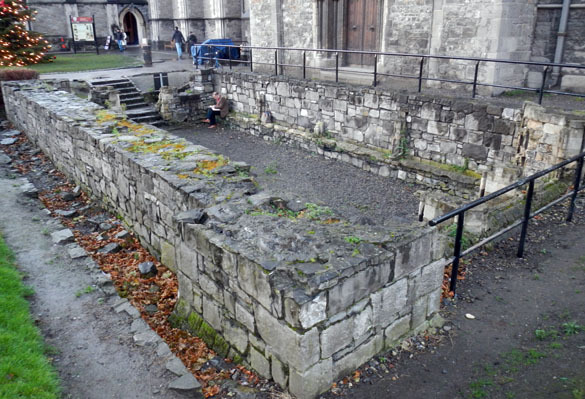 Apparently monks, priests and other church notables would meet in this building and sit on the stone benches just like Tim. The stones in this ruin include original materials (like the Dundry) and a variety of other lithologies. I had a great time learning about stonework, Medieval building techniques, and the various structural properties of limestones, all thanks to Tim. Tomorrow I’ll be back in the more secular pews of the paleontological meeting. I’m happy to have had this spot of unexpected fieldwork! Mark- interesting.. that reminds me.. Simon Winchestor’s book The Map That Changed The World has a really lovely chapter on the Jurassic oolite facies of England..